There are some people you meet in life that will have little impact on you. And then there are those who you never meet face to face that have a great impact. Bo Lumpkin was one of the latter. Bo was the purveyor of Gatorhead and I’ve Been Thinking, where he most recently began posting his jewelry that he sold locally. Bo’s encouragement and consistent commenting not only on my site but all over the webcomic sphere was very much appreciated and his nuggets of wisdom will be missed. Here is one of my favorites. I recall an email conversation where he lamented about the lack of visitors he received to his sites. To which I had to explain to him that for all it seems, my numbers weren’t much better haha. But somehow that didn’t stop him from consistently visiting others site to drop a bit of Bo Wisdom. And then something amazing happened. 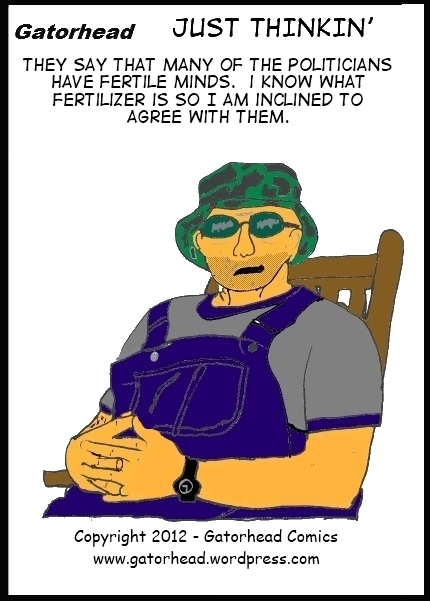 Bo Lumpkin grew into his own character that others wanted in their webcomics. Barry B made a YouTube animation using Bo as the main character. Michael Pohrer did his own version of Bo’s Creatures of Habit feature. George Ford had Bo make an appearance or two at Addanac City. And then you have JP Keslensky of Bug Pudding who named his recurring character of an alligator, Bo Gator. Michael Phelps of Life on 66 also named a character after Bo and even modeled the look on the real guy. I am sure I am missing others but you get the idea. I know if there is something after this world that Bo is jabbing away at anyone that will listen bragging on his family and dropping some wisdom. If so, Bo put in a good word for those of us who can never live up to the example you set here in this world. awwwwwwwwwwwwwwwwwwwwww rest in peace ! Still not back, but when I saw your piece on FB I had to stop by and thank you for putting this together, Bearman (a wonderful tribute for a wonderful man). I wish I knew how to express my thoughts better… Bo was such a great guy… genuinely kind and always so incredibly supportive of everyone. He brought a lot of happiness to so many of us. He is greatly missed. I’ll never forget him. I didn’t know him, but he sounds like he was a great guy. He made an impression on many and that’s shown in all the tributes I’ve seen about him. Bummer. I didn’t know him, but did read some of his comments on here from time to time. A very nice tribute post. Man, I couldn’t believe what I was reading. I’m very sorry to hear about Bo’s passing and my sympathies and sorrow goes out to his family. Bo was a great guy, an immaculate gentleman, and he will be sorely missed. Love ya, Bo! Bo was a great guy, funny and wise, and always kind to everyone. His perspective on things cut to root of the matter in a gentle, but insightful way. Very kind-hearted send-off to a funny guy. Haven’t been around much, but was much saddened to hear that Bo had passed on. May he continue to lighten hearts forever. 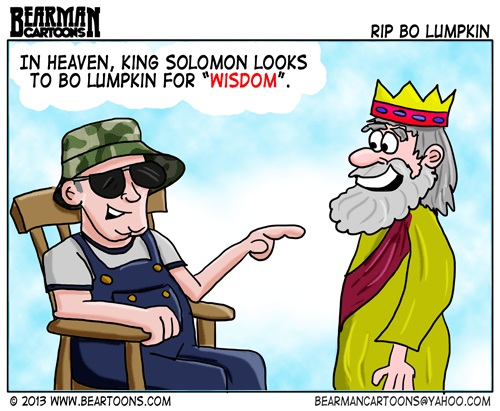 Rest in Peace, Bo Lumpkin. A nice tribute, Bearman. I didn’t know Bo except through comments and actually hearing that he had been sick through social media. He leaves a great legacy behind with so many kind words and tributes. Since I didn’t really know him I don’t feel qualified to comment but what you did here was really good. Nice tribute Bearman. Great tribute to a great man, Bearman! That would be nice for them to know. Oh no no no This just such a sad news. I remember my last interaction with Bo when i asked his advice on making cartoons and he didn’t even know me but was such an angel guiding me on it. You will be missed Bo love ya will always do Bro. Thanks Soma. Glad he was able to help you out. Soma! You haven’t been kidnapped by aliens? I’ve been searching the sky for you! Bo, along with you, George Ford and a few others were the first people I – I guess the right terminology is ‘met’ – here in this vast, webcomic world when I started posting comics up. He was always commenting and stopping by to see what was new. So anyway, I feel like I knew him for awhile (even though I’ve been a bit busy and distant from posting online in the last few months). I’ll miss his take on things. Sad to hear of his passing, but I’m sure he’s up there working on some Gatorhead comics and more! I am sure he is keeping busy. Thanks Nate! I didn’t know that Bo had passed. When was this? I just recently received emails from a couple of his web sites. What a surprise. Last week Rosie. The funeral was this past Monday. Nice tribute. I count myself lucky that I knew Bo, and got inspiration, and encouragement from him. It’s strange that despite the fact we never met in person I consider him my friend, and miss him as much as I do, but that just shows how wonderful, and great a man he was. Great tribute, Bearman. Rest in Peace, Bo. Bo’s grandson posted a notice on Bo’s twitter page which just saw. I added my comment, might be nice if a few others added theirs. He was a wonderful gentleman. So sad, but I do love the tributes. Bearman this is Christy, Bo’s daughter Daddy loved each and everyone of his comic friends. My dad was a great man a comic writer, a jewelry maker, a Baptist preacher and so much more. Bo was always happy and never wasted a day. I miss him terribly, but I know we will be reunited again one day. Bo was a Christian man who lived his life for Jesus. I can be happy knowing, because of God’s gift of his Son I can be with my daddy again. I imagine how wonderful his life is in heaven. Thank you for the plant. He loved the comic world and I can see they loved him. May God Bless You all. Thank you for sharing your thoughts and letting us know a bit more about Bo, Christy. Bless you and your whole family. I thought that I had been on this one Bearman but no, and I apologise for my late response, Bo was a lovely guy with a heart of gold and he is definitely missed around our blogosphere and far beyond. Bo will be missed. I knew he was ill but had my fingers crossed. I was out of town and found out a week or so later. He was a great cheerleader for us webcomic artists. That indeed Leroy though now I picture him with pom poms in his hands.